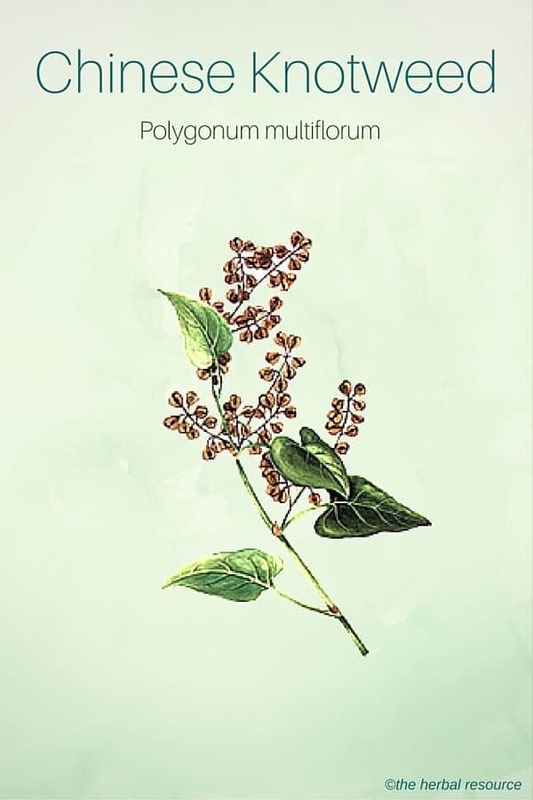 The generic name “Polygonum” is probably derived from two Greek words – “poly” means “many” and “gonu” means “knee” in reference to the swollen articulated nodes of the stem. The species name “multiflorum” may be derived from the Greek words – “multi” means “multiple” and “florum” means “flowers” in reference to multiple flowers arranged in the form inflorescence. The plant belongs to the plant family Polygonaceae. Other Common Names: Climbing knotweed, flowery knotweed, fo-ti, fo-ti-teng, he shou wu, or ho shou wu. Habitat: Polygonum multiflorum is widely seen in all parts of China and it is cultivated all around the country. Plant Description: Chinese knotweed is a herbaceous vine, which quickly spreads and covers any available surfaces. The flowers are delicate that bloom in the fall. The root tubers are irregular, cambiform; the approximate dimension is about 6 to 15 cm long and 4 to 12 cm in diameter. The tubers are reddish-brown in color, wrinkled, and consist of transverse and longitudinal lenticels. Plant Parts Used: Dried roots tubers. Fo-ti is one of principal ingredients of the “Shou Wu Chih,” which is one of the Chinese patent medicines. In China, it is believed that the medication prepared from this plant rejuvenate the body. It has been suggested that fo-ti may be useful as a medicinal herb to relieve symptoms of Alzheimer’s. 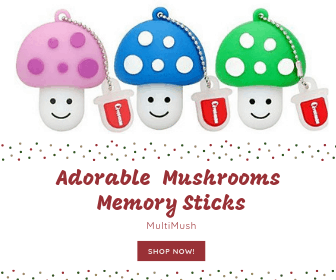 It is thought that an alkaloid present in the root tuber is responsible for the rejuvenating effect on the brain cells, the endocrine glands, and the nerves. It is said to balance a fragile yin, toning the kidneys, safeguard the skin from the harm caused by UV-B, and treat premature graying of hair and weak bones. In China, it is widely believed that fo-ti returns the natural black color to the previously grayed hairs. Chinese knotweed has a laxative property. It contains stilbene glycosides, which is similar to resveratrol. It has superior antioxidant property. Resveratrol extracted from fo-ti closely resembles the extract of Japanese knotweed (P. cuspidatum). Resveratrol is believed to extend the lifespan by various mechanisms. Fo-ti seems to stimulate the adrenal gland and help detoxicate the body. It has been used to get rid of atherosclerosis, blood deficiency, carbuncles, eczema, goiter, heat toxicity, high cholesterol, hypertension, lymph node inflammation, nerve damage, scrofula, sores, and wind rash. 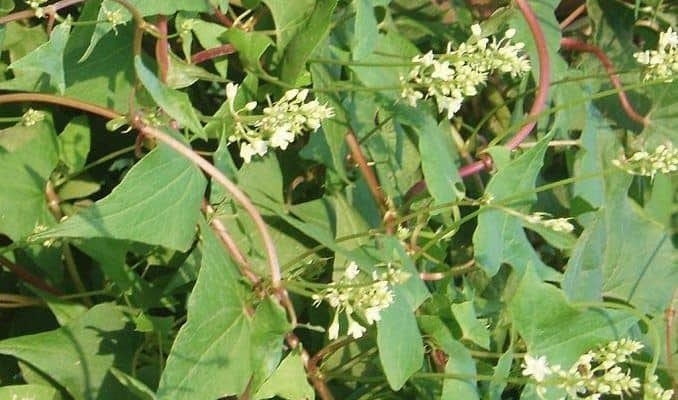 Chinese knotweed has a reputation as a herb that could be helpful to increase fertility naturally in males and as an herbal impotence remedy. Fo-ti is also believed to be a good herbal remedy to elevate the immune system naturally and to lower the level of bad cholesterol and meliorate from exhaustion. Some clinical research about fo-ti reveals that the herb has the characteristics to strengthen immune system, facilitate the formation of red blood corpuscle, and fight against various pathogenic bacteria. Chinese knotweed is available in both unprocessed forms and processed forms. In the United States, there is no difference between these two forms, even though the forms have reasonably different effects. The ones prepared by drying process are known as crude samples and the ones prepared by the process of steaming with the extract of black soybeans as prepared sample. The prepared samples are believed to promote lymphocyte transformation, reduce serum cholesterol, and cure atherosclerosis; and the crude samples are purgative. It is recommended and safe to consume around 9 to 25 g a day. The rare side effects associated with the consumption of Chinese knotweed is a gastrointestinal disturbance, which is seen in some cases. Soft stool has also been noted in some cases due to overdose.